Up before the sun to wake the birds and brush away the clouds. That’s us. We have breakfast out on the terrace as the hotel don’t start their serving in a while. Katja is used to getting up early these days, I’m a bit grumpy and sleepy. Sounds familiar? We go over to the yoga barn for pick up and meet the others from class that are coming along. It’s about one third or so that’s signed up for this. We’re going to a retreat in Ubud where it’ll all happen. The retreat it’s beautiful. 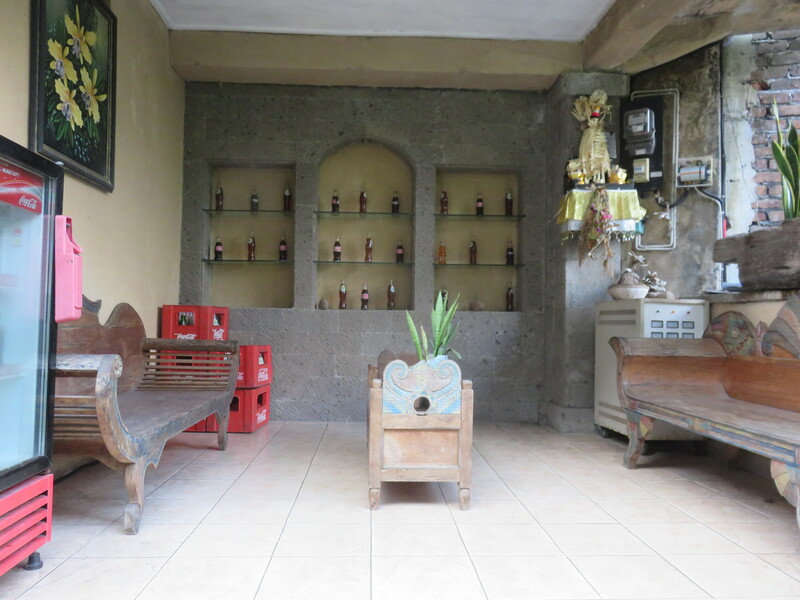 Soulshine retreat it’s called, just ten minutes from Ubud center with car. Well, at least on a non-trafficy day. We meet Les and set up shop. Luckily for me I get hold of a couple of bolsters and blocks and sit rather comfortably. I need it as I overstretched the inside of my left thigh on yesterday’s yin class. I suggest notice at first, but it’s gradually making it more painful. I know what and where I did wrong, ’cause I didn’t listen to Levi. Stupid stupid self. The theme of the day is yamas and niyamas. The ancient guiding rules connected to yoga about how to live your life towards others (yamas) and toward self (niyamas). It’s not the ten commandments, but there are similarities like non-stealing. The major difference lies toward the benefits given to you, and the fact that we talk about how to incorporate this in a modern society. It’s five yamas and equally many niyamas. We spend three hours on each segment including a light physical yoga practice with poses reflecting what we just discussed. The group is very open and sharing and some of it better stay in the group. We break in the middle for almost two hours where we spend time in the pool and eat a delicious lunch. We’re doing this from 9-17 before it’s time to go home. We’re dropped off almost at the hotel and walk the short few meters home. Back home we sit over the terrace having a soda water and taking. Today’s session have stirred up several elements it’s good to talk about. Being so close as we are these days, we share thoughts and opinions, make plans and connect even deeper. Sharing your inner feelings is somewhat scary if you don’t trust the receiver completely. When you do trust someone though, it’s rewarding, refreshing and liberating. Everyone should have such a friend. I’m glad Katja is mine. We go to the Italian restaurant again. SURPRISE! Where we get a little extra from the owner. A little plate with roasted bread and assorted tomato combos. The one with anchovy was particularly different. We continued talking with no regard for anyone understanding us before wrapping it all up and heading back. As if the day with it’s penetrating thoughts of inner most self wasn’t enough, Katja spends an hour reading and rereading course material. I got to hand it to her, she got one of the most powerful engines in this family.